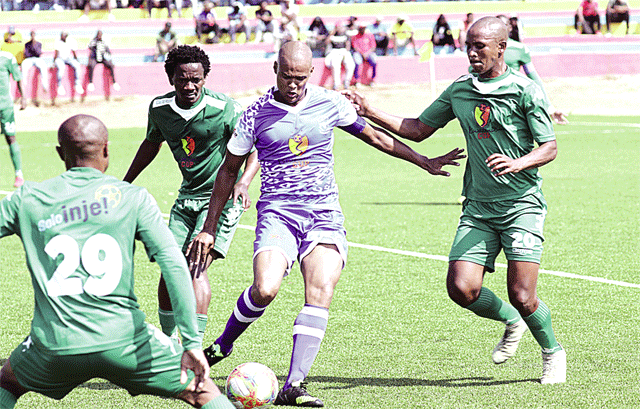 SOCCER – ROYAL Leopard avenged their 0-2 loss to Green Mamba in style as they reached the EswatiniBank Cup final at the King Sobhuza II Stadium in Nhlangano yesterday. The police side was made to work hard for their victory as Green Mamba FC competed effectively in the whole game. By reaching the final, Leopard gave themselves a chance to record their fourth win in the competition following triumphs in 2007, 2011, and 2014. Green Mamba, for their part, gave a good account of themselves in front of a packed venue in the Shiselweni region as the attendance justified the Management Committee (MC)’s decision to move the games to that part of the country. Barry Steenkamp continued his good goal-scoring form as his solitary goal after 54 minutes ensured his team preceded to the last stage of the competition. A variety of chances were orchestrated by both teams, with most not taken, allowing Barry’s goal to stand unchallenged until full time. By scoring the winner, the striker made amends for an earlier miss when he was set up by Sifiso Matse in the 12th minute of the game to come one on one with Green Mamba’s keeper, Thokozani Mkhulisi but failed to convert. Green Mamba attacked with purpose for much of the game, and were unlucky not to equalise in the 40th minute when Mxolisi Mkhontfo crossed for Linda Nkambule who headed wide. The tempo of the game was increasing at every turn, and Mkhontfo saw his long range shot from outside the box pushed wide in the 43rd minute. Lungelo Tsabedze was free on goal in the 44th minute but took too much time on the ball until Green Mamba’s defender Banele ‘Makonose’ Dlamini recovered to block his shot. The teams were deadlocked at 0-0 at half-time. At the restart, Green Mamba’s coach, Caleb Ngwenya made a change bringing on Phinda ‘Phindrix’ Dlamini for Linda. The change did not bring immediate impetus for his team as leopard scored within 10 minutes through Barry Steenkamp who benefitted, from a cross by Lungelo on the right. Green Mamba changed tactic afterwards as they crossed the ball many times into the box, with striker Musa Dlamini getting on the end of those balls without luck. Leopard sat back for the latter stages of the game until they brought on Bonginkosi ‘Manyovu’ Dlamini in the 70th minute. He made good runs into the opposition’s danger areas as they left spaces at the back while searching for the equaliser. Mkhontfo was unlucky in the 88th minute when his shot from the edge of the box was spectacularly saved by Phephisani Msibi in Leopard’s goal. That was the best, and last chance for Leopard to equalise as referee Thulani Sibandze soon blew the whistle to end the game. Green Mamba – Thokozani, Mcolisi Manana, Thabiso Gumbi (Oladele), Sanele Khumalo, Makonose, Khethokuhle, Xavi, Njabulo Tfwala (Banele Mdluli), Musa, Mxolisi, Linda (Phinda).